Surah Al Haaqah - The Inevitable Reality: Summary of 69th Chapter of the Holy Quran ~ Islam My Ultimate Decision . Sūrat al-Ḥāqqah is the 69th surah with 52 ayats with two rukus, part of the 29th Juzʼ of the Holy Qur'an. The surah was revealed in Makkah. The word Haaqah is from the word Haq and it means that which is to happen, the inevitable reality. The surah can be divided into two parts: The first section (verses 1-37) carries a strong description of the Hereafter, while the second section (verses 38-52) is about Qur’an being a revelation of Allah and the Prophet Muhammad (peace be upon him) being a true Messenger of Allah. “Nor is it the word of a soothsayer, little is that you remember! This is the Revelation sent down from the Lord of the ‘Alameen,” (69: 42-43). On hearing this Islam entered deep into my heart. [Musnad Ahmad]. This tradition of Hadrat Umar shows that this surah had been sent down long before his acceptance of Islam, for even after this event he did not believe for a long time, and he continued to be influenced in favor of Islam by different incidents from time to time, till at last in the house of his own sister he came by the experience that made him surrender and submit to the Faith completely. The surah begins with the word "al-Haaqqah" which means an event which has inevitably to take place and the occurrence of which in the future is so certain as to admit of no doubt or suspicion. To use this word for Resurrection and to begin the discourse with it by itself shows that the people were denying its occurrence. They are being told: That which you are denying is inevitable: your denial will not prevent its occurrence. 1. The (Inevitable) Reality (i.e. the Day of Resurrection)! 2. What is the Reality? 3. And what will make you know what the Reality is? These two questions in verse 2-3 have been put to arouse the listeners, to make them understand the importance of the theme and listen to what follows with full attention. 4. Thamud and 'Ad people denied the Qari'ah [the striking Hour (of Judgement)]! 5. As for Thamud, they were destroyed by the awful cry! People of Thamud demanded a miracle of witnessing a ten month pregnant she-camel emerge from a certain rock. Their Prophet Saleh (peace be upon him) made them promise that if their request is responded to they would believe in him and follow him. They agreed to do so. But when the she-camel emerged they wanted to get rid of it because they still disbelieved in their Messenger despite benefiting from the camel and plotted to kill it. As result, they were punished by Allah by a strong earthquake and overwhelming cry. They were overtaken by this and were left dead in their homes. The punishment of the people of Thamud has been described in other surahs of the Qur’an as well. In Surah al-A’raf ayah 78 it has been called ar-rafjah [الرَّجْفَة] meaning a terrible earthquake; in Surah Hud ayah 67 it has been termed as-sayhah [الصَّيْحَة] meaning a violent blast; in Surah Fussilat ayah 17 it has been said that were overtaken by saaiqatu al-aathab [صَاعِقَةُ الْعَذَاب], a humiliating scourge. These words describe different aspects of the same calamity. 6. And as for 'Ad, they were destroyed by a furious violent wind; 7. Which Allah imposed on them for seven nights and eight days in succession, so that you could see men lying overthrown (destroyed), as if they were hollow trunks of date-palms! 8. Do you see any remnants of them? “And as for ‘Ad, they were destroyed by a furious violent wind,” (69: 6). Sarsar [صَرْصَر] is a harsh, cold and bitter wind which chills down to the bones. Sarsar is a repeated word which means it is a wind which continuously repeats itself. The winds continued to blow fiercely for seven nights and eight days without any mercy or blessing. They would cause the palm tree to hit the ground, and fall down on a person’s head. That man’s head would shatter and the trunk would remain a lifeless corpse. “Do you see any remnants of them?” (69: 8) meaning do you find any one of them left or anyone who even attributes himself to being from them. Rather they are all gone, right down to the last of them, and Allah did not make for them any successors. 9. And Pharaoh, and those before him, and the cities overthrown [the towns of the people of [Lout (Lot)] committed sin, 10. And they disobeyed their Lord's Messenger, so He punished them with a strong punishment. 11. Verily! When the water rose beyond its limits [Nuh's (Noah) Flood], We carried you (mankind) in the floating [ship that was constructed by Nuh (Noah)]. 12. That We might make it a remembrance for you, and the keen ear (person) may (hear and) understand it. As for the Pharaoh, it has been described in many Hadiths that Angel Jibreel [Gabriel] was ordered by Allah to lift the cities of Sodom and Gamorah and slam them upside down. They were then pelted with stones upon stones. This was their punishment in this life and in the Hereafter much worse and everlasting awaits them. The mention of punishment of people of Lot and the great flood of Noah has already been told in our earlier posts: Prophet Lot and Wrath of Allah on his people and Prophet Noah and the great flood. In the verse 14. a word "dhukka" has been used which is from the root dal-kaf-kaf which means ‘to crush, break, beat, crumble to pieces, to push or thrust’. It is severe smashing that breaks something and levels it to the ground. On the Judgment Day, both the earth and the mountains will be smashed into each other, and they will turn into dust. One smashing and everything will turn into small particles. This again shows us the power of Allah. While reading the verses (13-16) one should keep in mind that at some places in the Qur'an the three stages of Resurrection which will occur one after the other at different times have been mentioned separately, and at others all the three have been combined and mentioned as a single event. For example, in (Surah An-Naml, verse 87) the first blowing of the Trumpet has been mentioned, when everyone will be suddenly struck with terror. At that time they will witness the general confusion and the upsetting of the order of the universe, as described in (Surah Al-Hajj, verses 1-2); (Surah Ya Seen, verses 49-50) and (Surah At- Takweer, verses 1-6). In (Surah Az-Zumar, verses 67-70), mention has been made of the second and third blowing of the Trumpet. On the second blowing of it everyone will fall down dead, and when it is blown for the third time, all dead men will rise back to life and present themselves before Allah. In (Surah Ta Ha, verses 102-112); (Surah Al-Anbiya, verses 101-103); (Surah Ya Seen, verses 51-53 )and (Surah Qaf,verses 20-22), only the third sounding of the Trumpet has been mentioned. But here and at many other places in the Qur'an all the events of Resurrection, from the blowing of the first Trumpet till the people’s entry into Heaven and Hell have been described as a single event. 17. And the angels will be on its sides, and eight angels will, that Day, bear the Throne of your Lord above them. 18. That Day shall you be brought to Judgement, not a secret of you will be hidden. The mention of Allah Almighty would be sitting on the Throne (verses 17-18 above) and that eight angels would be upholding it along with Him has been used to give an idea of Allah Almighty’s rule and sovereignty. And a scene has been constructed as of worldly kingship and the same terms have been used for it as are common for kingship and its accompaniments in order to enable us to understand matters pertaining to sovereignty of the universe to some extent only by means of this very scene and terms. Besides, the conception of God that the Quran gives also prevents one from imagining that the Being Who is free from physical existence as to body, direction and place, should be residing somewhere and His creatures should sustain Him. Therefore, pursuing any research to determine its meaning would be tantamount to disbelief. 19. Then as for him who will be given his Record in his right hand will say: "Take, read my Record! 20. "Surely, I did believe that I shall meet my Account!" 21. So he shall be in a life, well-pleasing. 22. In a lofty Paradise, 23. The fruits in bunches whereof will be low and near at hand. 24. Eat and drink at ease for that which you have sent on before you in days past! 25. But as for him who will be given his Record in his left hand, will say: "I wish that I had not been given my Record! 26. "And that I had never known, how my Account is? 27. "I wish, would that it had been my end (death)! 28. "My wealth has not availed me, 29. "My power and arguments (to defend myself) have gone from me!" 30. (It will be said): "Seize him and fetter him, 31. Then throw him in the blazing Fire. 32. "Then fasten him with a chain whereof the length is seventy cubits!" 33. Verily, He used not to believe in Allah, the Most Great, 34. And urged not on the feeding of the poor, 35. So no friend has he here this Day, 36. Nor any food except filth from the washing of wounds, 37. None will eat except the sinners, disbelievers, polytheists, etc. 38. So I swear by whatsoever you see, 39. And by whatsoever you see not, 40. That this is verily the word of an honoured Messenger [i.e. Jibrael (Gabriel) or Muhammad which he has brought from Allah]. 41. It is not the word of a poet, little is that you believe! 42. Nor is it the word of a soothsayer (or a foreteller), little is that you remember! 43. This is the Revelation sent down from the Lord of the 'Alameen (mankind, jinns and all that exists). 44. And if he (Muhammad ) had forged a false saying concerning Us (Allah), 45. We surely should have seized him by his right hand (or with power and might), 46. And then certainly should have cut off his life artery (Aorta), 47. And none of you could withhold Us from (punishing) him. 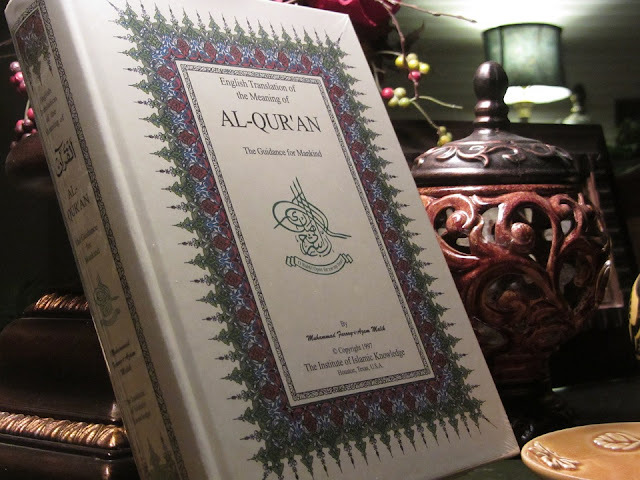 This means that while the Qur'an is potentially for all, only those who possess certain qualities can benefit from it. The first such quality is piety: those who want to benefit should be disposed to distinguish between good and evil, and to shun evil and do good. Those who lead an animal existence, who never consider whether their actions are either good or bad, who are helplessly tossed about by the animal desires that dominate their minds, such persons are all together incapable of deriving any benefit from the guidance embodied in the Qur'an. The concluding verse (49-52) say it all for the truth contained in the Holy Qur'an, the book of commandments of none but Allah, the Almighty. That is, the Qur'an is an admonition for those who wish to avoid wrongdoing and its evil consequences. And they will ultimately have to despair and regret as to why they had rejected this Qur'an. 49. And verily, We know that there are some among you that belie (this Qur'an). 50. And indeed it (this Qur'an) will be an anguish for the disbelievers (on the Day of Resurrection). 51. And Verily, it (this Qur'an) is an absolute truth with certainty. 52. So glorify the Name of your Lord, the Most Great. May Allah grant us wisdom to understand the Holy Qur'an and live a life as commanded therein and as followed by the Prophet Muhammad (may peace be upon him), Aameen.